For the first time this year, the weather consistently rose above 60 degrees. The long awaited Spring has arrived and hasn't failed me yet (fingers crossed). 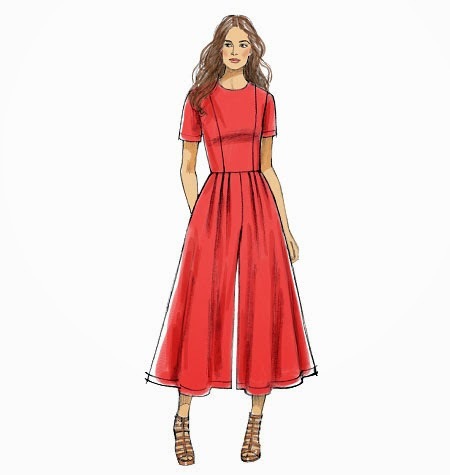 Today's dressy jumpsuit is courtesy Vogue Pattern 9075 found (HERE). The dabric is a "hot tamale poly/twill suiting" from Fabric Mart. Once I saw the color, I couldn't wait to get my hands on it! This is one of the simplest patterns I've sewn in a while. In under 3 hours, I had a completed garment. Instead of lining this top, I opted to create a facing for the center front, and center back pieces, using the original pattern piece. Once attached, The pattern piece and the facing (both with finished edges) were pressed towards the facing, under stitched, clipped in the curve. I repeated this step for the (2) center back pieces. From here, all other steps should be according to the manufacturer's instruction. I will be completely honest, this pattern is so simple, I did not read the instructions at all! I assembled the pants, put the pockets on, sewn my pleats (which I laid flat instead of towards the center front), a double hem on the sleeves and pants, added the a zipper and that was IT! You cannot construct a jumpsuit any simpler!. And there you have it! I can't wait to wear this over the spring/summer. That is SO cute! I love that red color. Great color on you! Thanks for the tips. This is spot-on! Enjoy wearing it as I'm sure you're going to receive a lot of compliments. This is so cute on you! I'm sure you will receive a lot of compliments. Just beautiful. I have enjoyed reading your sewing posts. Red is definitely your color, Girl! I must say, you look fab. Not everyone can carry off this look! That's sophisticated and cool. That's what they call "effortlessly chic". Love this! I have been so hesitant about jumpsuits but this version might make me a convert!! Thanks for the inspiration. What a beautiful jumpsuit! I love the color. I am going to revisit this pattern, and make it in white! The drawing looks like the waistline sits on the waist but your dress looks like it is a dropped waist with the belt being much higher. Did you alter the bodice length to be a dropped waist? You said you just sewed the pattern right out of the envelope. Love the outfit, love the color, just confused as to the dimensions. Hi Mrsmole, I did not make any adjustments to the waist on this pattern. The waistline is exactly where the belt is. Thanks so much! Thank you for this!!! It looks so great and the fact it is easy makes me want to get this pattern and get started.....the color is just awesome. I looked at the pattern and was deciding if I wanted to get it now I do!! You look great in it and the color is perfect on you too. This is AWESOME. Totally thought it was a dress at first. Love how bold it is with that red! Made by a Fabricista: Mint Chocolate Momma. We're Sponsoring a Contest on Pattern Review!